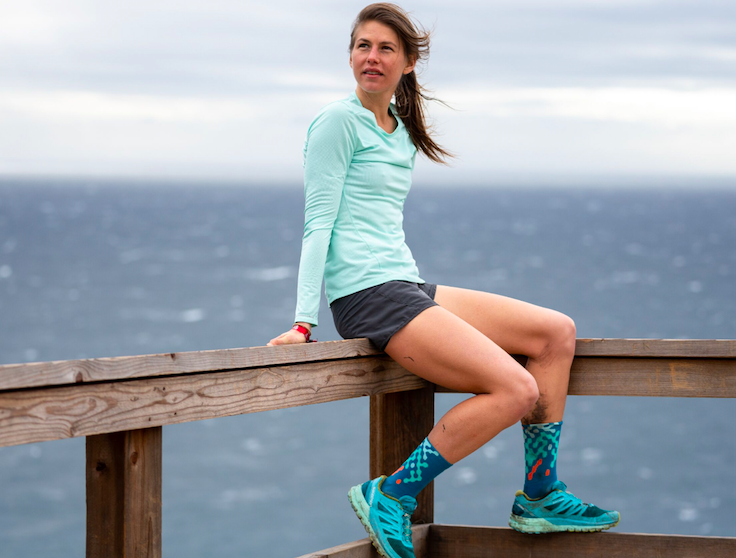 Feetures, the sock brand, has signed on as the official sock sponsorship of ultrarunner Cat Bradley. Bradley will round out the Feetures athlete team, which includes other running notables Kyle Merber and Anna Frost. Bradley, winner of the 2017 Western States 100 in the toughest course conditions known to date, has been a fan of Feetures since 2015. “I put on my first pair of Feetures socks the morning of the grueling 2015 Bear 100 and for the first time ever during a race, didn’t think about my feet once. Twenty-three hours later, I credited my first 100-mile win to my happy feet and precise fitting socks. From then on, I have been hooked! I spent my next paycheck stocking up on Feetures Socks and haven’t raced in another brand since,” said Bradley. In addition to her groundbreaking Western States 100 win in 2017, Bradley also broke a 10-year Grand Canyon R2R2R FKT record by 23 minutes, becoming the first woman to break 8 hours. At the 2018 UTMB, she was the first American woman to cross the finish line, becoming one of the ten fastest women in the race’s history.